Carson Lueders has just finished the sixth grade, and life is pretty cool. The skinny 11-year-old has a motocross bike his parents let him race on weekends. He’s got one basketball hoop in his driveway and one in the living room, where his mom lets him practice his dunks all day. There’s an electronic drum kit that he can pound on anytime. He’s got a couple of guitars, three dogs and a Razor scooter. But then, that’s stuff lots of kids have. Where Carson Lueders’ life differs from the typical kid is in the hundreds of envelopes and trinkets from fans around the world that sit in gigantic piles throughout the Lueders house. There are carefully sketched pencil portraits of his face from Korea, envelopes full of money from Wales, stuffed animals from Australia and more marriage proposals than the typical 11-year-old can even comprehend. His life differs in the freshly opened boxes of neon wristbands with his name in bubbly white letters, and the T-shirts with his face plastered across the chest, in the millions of YouTube views, the monthly trips to Los Angeles to meet with agents and producers. In the past year, the kid with the white-blonde hair has stopped attending a regular school and started being homeschooled. His talent for singing YouTube covers of Justin Bieber and Keith Urban and Cody Simpson songs has gone from a hobby to a full-blown career, one that takes him from his Newman Lake, Wash., home to recording studios in L.A. and stages in San Diego too often for him to be a regular middle schooler. After three years of posting videos on YouTube, early last year Carson got a shout-out on Twitter from Australian pop star Simpson. Then in March, country superstar Keith Urban sang his praises for a cover of his song “For You” that Carson and older brother Jackson had posted. “WOW!!!!!!!!!! Just saw this video on @YouTube...totally got to me!!!! Awesome job guys!!!! -KU” Urban wrote on his Twitter page. 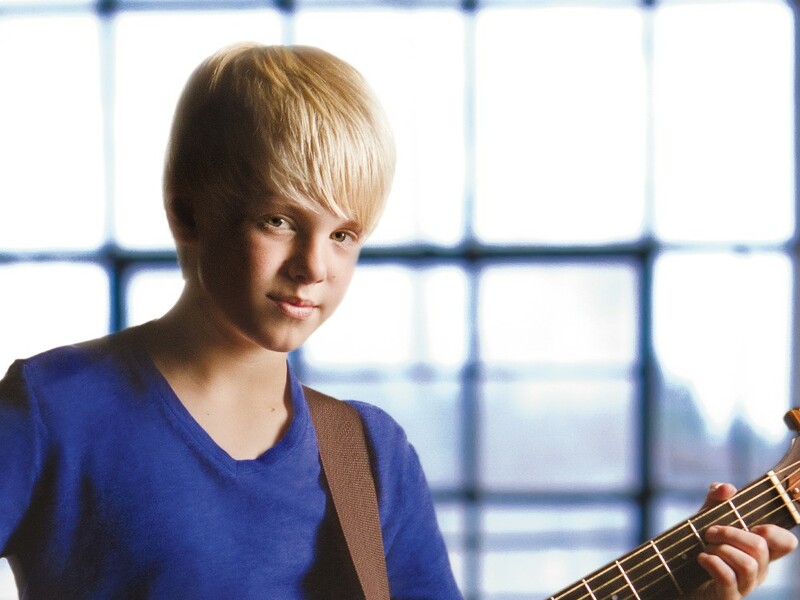 The Lueders family woke up the next morning to thousands of new fans praising Carson for his songs online. Carson walks back into the living room where his mom and his basketball hoop sit — a spacious great room with a panoramic view of Newman Lake’s glassy water, just a baseball’s throw away — and points at her. “Eight and a half,” he corrects, plopping down in a chair with an orange and a giant bag of kettle corn. “Eight and a half million YouTube views!” she exclaims. A year ago, none of the Lueders family could have dreamt it. Diane Lueders calls her son’s musical talent a “gift from the Lord,” something she and her husband and their other two children noticed about the youngest Lueders early on. They dressed him up as Elvis one year — Diane bejeweled her eldest son’s karate outfit and bought a black foam pompadour from Walmart — for a school talent show. With a barrel-sized guitar around his shoulders and foam hair bigger than his own head, Carson took the stage and sung a verse of The King’s “Hound Dog” to a clapping crowd. Another time he froze in front of a talent show crowd. His father Jon stood beside him and sang most of the words to “Amazing Grace” while Carson stood silent. A year ago, the family decided to fully pursue his career so that Carson — who looks unflinchingly into the camera as he sings and easily performs dance sequences like he grew up on Michael Jackson and Justin Timberlake videos — could figure out if it was what he truly wanted. “I was recording ‘til like 1:30,” he says. “Never mind.” He picks up the kettle korn and shoves a handful in his mouth. In the past year, the Lueders family has seen their youngest son change from an elementary school kid in a sparkling karate uniform to a tiny businessman who mentions contracts, publishing percentages, product endorsements and sponsorships in conversations before his mom does. His parents, backed by millions of supporters from 110 countries (they’ve counted), see an immense talent in Carson. He could be the next Simpson. Maybe the next Bieber. Carson looks down at the tape recorder sitting next to him. “We’ve been talking for 58 minutes,” he says. He gets up from his chair and starts shooting at the indoor hoop, practicing his three-point shot. And right now, being the first Carson is not a shabby thing. “Someone just clicked on my music video,” Carson says from his imaginary free-throw line. “Isn’t that interesting?” Diane says. “Someone just clicked on my music video,” Carson says again. “I’m not saying they probably watch all of it... ” Diane continues. And Carson bounces the ball off the backboard, catches it mid-air and slam-dunks it through the hoop. Carson Lueders’ videos can be viewed at youtube.com/user/jdlueders.